Women, Widows and Water …. I had read the book couple of months back and have shared with all the experience I had gone through upon reading it. I also knew that Deepa Mehta had gotten into a lot of trouble while trying to shoot this movie but then dint know that it was made in Sri lanka and was released in USA.. Went for the movie with a friend at Satyam, 1.30show, yes, in the afternoon. Got into the theater, found our seats and waited for the movie to begin, saw a couple of Trailers and then suddenly saw Amitabh bachchan in full form on screen, shrugged it off saying “probably just another trailer” but then couple of mins passed and the titles came on the screen. This was it, we were ready to lose it, caused a ruckus and I promptly called the theater and spoke to a lady who had NO clues that the wrong movie was being screened, but then she did promise to rectify things. This movie is not your typical run of the mill, running around trees, singing duets, wearing lavish clothes, masala filled one, but it is a simple story of how widows lived back in 30’s and how difficult it was for them… But then its not a documentary but follows the story of a young girl who becomes a widow and how her life changes as she adjusts to this new life and the turmoils within every widow at the ashram. Lisa ray has done full justice to this role of Kalyani, the delicate, sweet, good-looking widow who is used by the head widow to earn money so she can live off it. A new hope comes into Kalyani’s life after her meeting with Narayan, played by John Abraham, an intellectual, Gandhian nationalist. Narayan falls in love with Kalyani and she also feels the same for him. He wants to marry her, despite an obvious opposition from his Brahmin parents. Seema biswas, she steals the show playing the character of Shakuntala with her strong personality and sweet demeanor, believes that widows too have the right to live, love and laugh… Within Shakuntala is a conflict between her faith and her inability to accept her fate. She is sincere in her devotional practice but she also questions the scriptures. The last scene is so touching shows us how much she cares about Chuyia and wants to get away from all that she has been through. 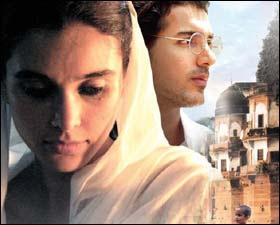 AR Rehman’s music is so subtle and perfect, very apt for the storyline and not overbearing..
All in all, this was a movie worth a watch and made me go through so many emotions- empathy, sadness, smiles, anger and some more. I don’t know if all that is shown in the movie really happened or not but I am sure atleast some of it is real, has to have been… The plot of ‘Water’ wends through some expected and unexpected twists and the story concludes on a hopeful note. And one of the important subplots in the movie is the effect that Chuyia and Kalyani have on Shakuntala.